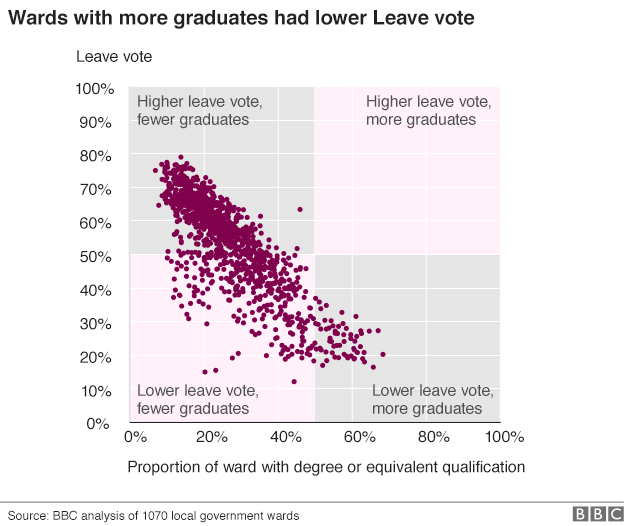 How should this BBC chart (Brexit correlation between education and results) have been drawn? But that got me thinking of how to draw this chart as objectively as possible. Would it be better to keep the x-axis linear, and have the two boxes on the right be three times as wide? Or keep the boxes all the same size, and squish and stretch the x-axis, so that every N pixel span covers the same number of data points? Or something else? I think this FT version of similar data serves as a decent answer about how to present the data fairly. I agree that coloring the quadrants pink is largely cosmetic, but overall I view this as a clear informative plot. The message is immediately apparent and is not misleading. The BBC has plotted the actual data points. They have not manipulated the x or y axes. The annotation on the plot is correct and not over-stated. They have not added spurious trend lines or any other unnecessary interpretation. Compared to most data figures presented in the media, this plot is excellent -- it is quite a good example of letting the data speak for itself. In short, I think you're over-thinking it. I don't doubt that you can find some ways to improve the plot, but simple is usually best. 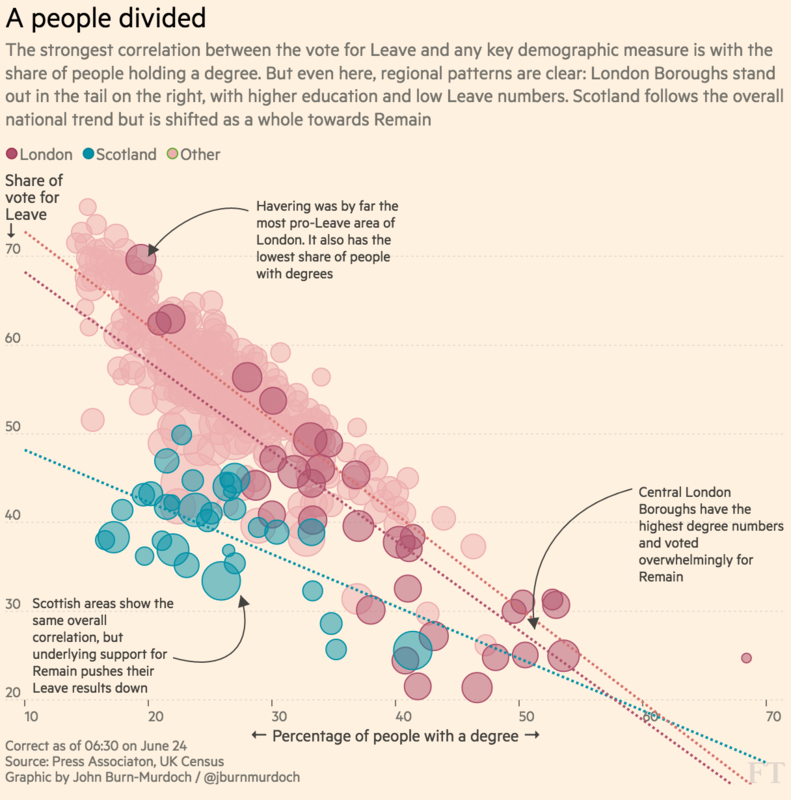 I agree that the graph is misleading in a sense that it purports to show that there are no data points in the quadrant categorically described as high leave vote %, high % of graduates. What is high and low becomes relative to the axis limits, not the actual data. While theoretically possible to have a ward with population that is 100% college educated, such ward doesn't exist. You don't need to invent data points to produce a misleading graph: a broken axis showing exaggerated change is an example that not too dissimilar to this one. A more objective way to visualise this data would be to set the scatter plot axis limits at the max / min of the data and then divide the chart into quadrants of an equal area. The reason I would go for the equal area of quadrants is so that the quadrants show an equivalent linear relationship between variables. The categorical descriptions of the quadrants, "high" and "low" are treated as equivalent so the areas should be as well. If instead we want to use quadrants as another way to quantitatively describe data, we could set the quadrant borders at the average of each variable as shown in Data Visualisation with R: 100 examples (available to preview on Google Books, p283,286). To add another analytical layer to a scatter plot visualisation, we can use colour and size of the dots. For example, colour can used to separate university towns from the rest, show voter turnout in a gradient or highlight General Election results for those wards. I'm not sure if size will be effective with so many data points, but you can potentially investigate different population bands, such as 65+, and how they are represented in the data. To my mind there are also two important caveats worth bearing in mind when looking at this graph: first, that it counts all graduates, regardless of whether they voted in the referendum or not, and secondly, that it includes resident graduates with EU passports who couldn't vote in the referendum (assuming the source data is Census-based). I agree, very misleading. I'd eliminate the colored background all together. There is definitely a trend, I don't think anyone would argue against that- maybe the author should stick with a trendline of some sort? Not the answer you're looking for? Browse other questions tagged data-visualization statistics-in-media or ask your own question. What is the name of this chart, and is there an online tool to create one? Should we remove axis and use direct label on scientific chart? How should items be ordered in a bar chart comparing items in two general categories? How should I map real values to a Circos chart? How to best plot and chart imputed data? How is this chart called? Percentile chart? Visualization: Difference between an absolute stacked bar chart and a spineplot?